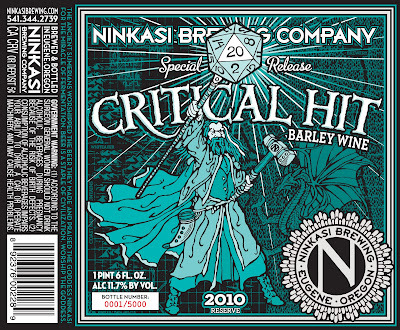 In the Ninkasi tradition, this Barley Wine is hopped to high heaven. Critical Hit has a rich malty expression but the 11 varieties of hops linger on the palate. Two-hundred and twenty pounds of hops were used to make only 17 barrels of beer! Its high gravity nature warms the cheeks and soul. 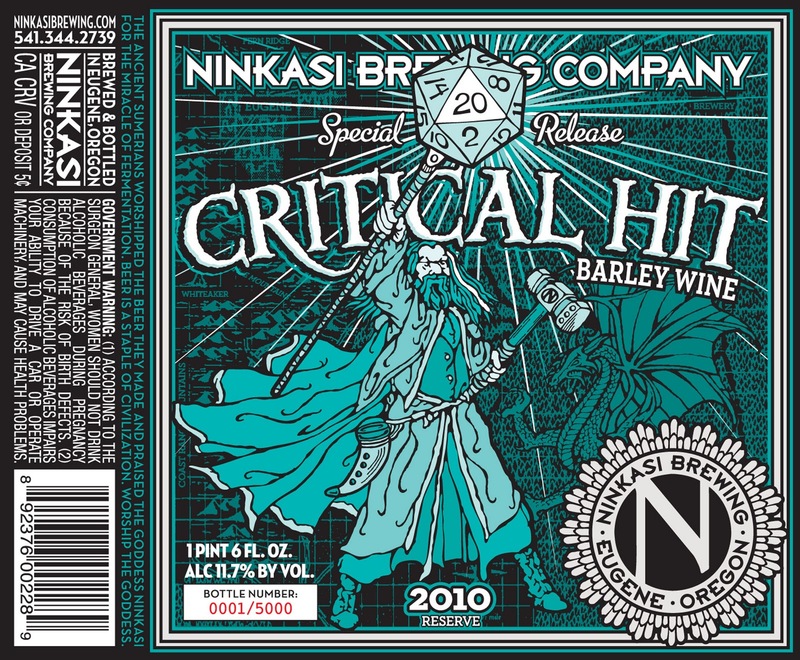 Pull out your 20-sided die — Critical Hit does double damage so you might have to roll versus save if you take this ale for granted. Massive citrus, earthy, resinous and grassy hop flavor is balanced with the melanoidin complexity of port and sherry notes to create a powerful and warming taste experience. stinky cheese, rye breads, hearty meats and stews, curries, bread pudding"
Just snagged up this 22 oz. wax dipped bomber at NW Liquid Gold for about $13.99. Have another to age. Let's taste shall we? Reviewing bottle 3920 of 5000. - A rather clear amber colored pour. About a finger of off-white foamy head which has settled to a big bubbly spotty mess in the glass. Not bad looking at all, but not what I really expected. I am used to more cloudy, darker barleywines. - Sweet caramel grain notes which seems to be rather tucked away in the brew. Certainly some strong alcohol and rubbing alcohol aromas. There is a nice fruity and citrus-like hop presence as well. Seems hot and fresh. - Sweet malts, bready caramel and quite biscuity. Bitter grassy hops with an earthy flare. The alcohol presence is quite noticeable and hot.. but the flavor isn't quite rubbing alcohol.. though close. It does have a character of its own which is hard to describe. Overall hot, and needs to sit. 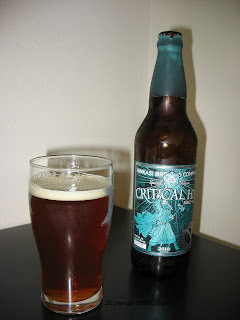 - Nice medium to full body and is a little creamy and well carbonated. It's explosive bitterness really dries the tongue, but the sweetness lends a lasting chewy character. Overall quite a decent feel to it. - Not bad.. and in usual Ninkasi tradition, this puppy is bitter! Lots of early boil hops going on here. 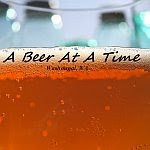 It's a bit strong, and could certainly use some time in a cold cellar. Though I don't feel this barleywine would get any better, it just may calm down the alcohol notes a bit. Certainly a good attempt though.